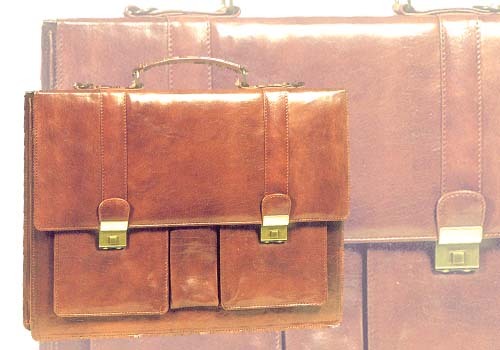 Description : A comprehensive unisex folio bag made from Italian leather. Two numeral locks close the bag. It has a zip pocket at the back. On lifting the front, there are two pockets of size 22 x 16 cm and between the two pockets is a smaller 15.5 x 7 cm pocket for glasses or a cellphone. On top of these pockets is another pocket 45.5 x 28 cm. The inside has two partitions, two pen loops with an inside zip pocket. There is plenty of room for files, papers (and not to forget the laptop).